PROVIDENCE, R.I. — I recently went on a walking tour of a sliver of South Providence known as Trinity Square. We went past Amos House and the Salvation Army. Past family homes and a block full of abandoned ones in the Barbara Jordan II development complex. Past boarded-up storefronts next to those bustling with business. My guide was Margaret DeVos, executive director of the Southside Community Land Trust. For her, these rundown blocks represent a land of opportunity. For organic farming, no less. In the heart of one of the state’s poorest neighborhoods, a green revolution is underway. “We’re really interested in making sure that people in low-income communities in Rhode Island have access to fresh, healthy and affordable food,” she says. The land trust does that by creating community gardens. One of its targets is Trinity Square. “We’re responding to blocks and blocks of vacancies by moving in,” says DeVos. She means it literally. Not only are community gardens sprouting up here — the land trust even bought a vacant building on Broad Street. Once the renovations are done, they’ll move there from their current home on Somerset Street. The first community garden took root at Somerset and West Clifford Streets back in 1981. 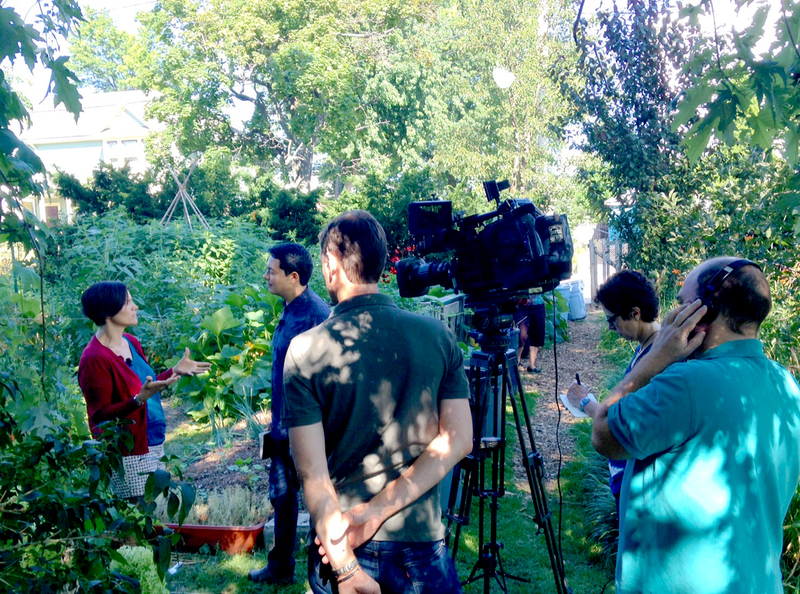 The land trust bought a vacant lot, and soon an urban Eden was born. Neighbors were given plots of land to grow all sorts of vegetables, herbs and fruits. Now the land trust owns, or helps run, 52 community gardens and farms in Providence, Pawtucket, Central Falls and Cranston. “When we purchase land, our commitment is that this is forever,” she says. It’s a long-term investment in sustainable agriculture, stabilization of neighborhoods, and in the health and well-being of residents, 85 percent of whom live below the poverty line. For DeVos (no relation to U.S. Education Secretary Betsy DeVos), this grass-roots work is a natural extension of her lifelong commitment to help struggling communities. DeVos, 47, grew up in Detroit, in a home filled with books on American history and biographies of the men and women who built this country. Both of her parents were educators, instilling a sense of civic and social responsibility in their daughter at an early age. As DeVos grew up, the Detroit region started to decline economically. Rather than skip town to find work elsewhere, she was part of a generation that chose to roll up its sleeves and help get the Motor City back on track. 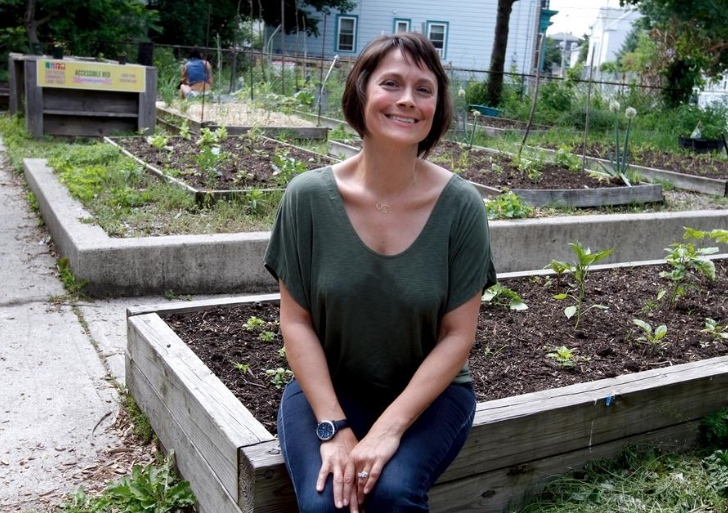 “My position at Southside Community Land Trust is a dream come true,” she says of her decision to uproot from Michigan six years ago and move to New England, where her husband, Michael, is from. Her passion for providing “real” food to those in need is palpable. “It’s true,” she says emphatically. “You are what you eat! DeVos estimates that 3,000 people now eat the produce from their gardens and farms each year. That’s huge when you live in a so-called food desert. “Planting organic food that’s chemical-free, even my health has changed,” Margarita Pons tells me as she proudly shows me around the massive garden in her front yard on Robinson Street. “I have diabetes, high blood pressure, high cholesterol. Margarita, 54, and her husband, Teodulio Martinez, 59, are grateful for the help the land trust has given them. They now grow everything from beans to lettuce, tomatoes, radishes, watercress, kale, herbs — everything you can imagine — just feet from their front door. She hands me some cilantro she just picked. She’s right. It’s delicious. Last year, the land trust made it possible for the couple to lease 2 acres of farmland on a property in Cranston that’s managed by the trust but owned by the state Department of Environmental Management. Now the couple pay $250 a year to use a greenhouse to grow their seedlings and to lease the land to grow their crops. They’ve also launched a business: Teo’s Products. Margarita’s the marketer. She’s gotten local stores, such as Sanchez Meat Market at Marlborough Avenue and Broad Street, to sell food that they and other land-trust farmers grow. Owner Alejandro Sanchez says he loves stocking the farm fresh, organic items in his store. The couple also sell their produce at area farmers’ markets the land trust has helped establish. “We are able to keep costs down for farmers so they can actually engage in growing food, make a little money and make food available to people at a price that’s more affordable and at a quality that’s super high,” DeVos says of the organic ecosystem they’ve created. Her work isn’t done. The land-trust staff is always scouting vacant lots to convert into community gardens. The land trust preps each parcel by building retaining walls and fencing, bringing in water and remediating the soil. It provides organic seeds and professional guidance. It’s even established educational and training programs for kids. This way, more people can truly enjoy the fruits of their labor. — Patricia Andreu is a freelance writer living in Providence, writes Women in Action, a periodic column. Reach her at WomenInActionRI@outlook.com.